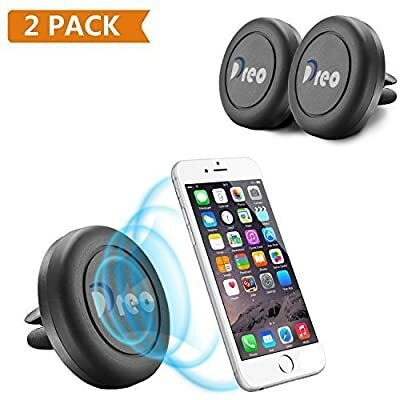 Car Mount Magnetic,powerful magnet will hold up your cellphone securely even with case on, while allowing you to drive without distraction. Easy to install and remove the car mount from the air vent, universal fits for cell phones, mini tablets and etc. Elegant design, simple and good assistance for your phone. Equipped with round and rectangle metallic plate, easy to install, fit for various size. Slim and lightweight design bring your car with a neat and organized look. 360 Rotate, Flexible swivel ball connect with powerful grip bring you a magic experience with 100% safe, you can place your phone in any orientation, horizontal or vertical. Package Includes:2pcs Magnetic Car Mounts,4pcs Metal Plates. Manufacturer one year warranty.